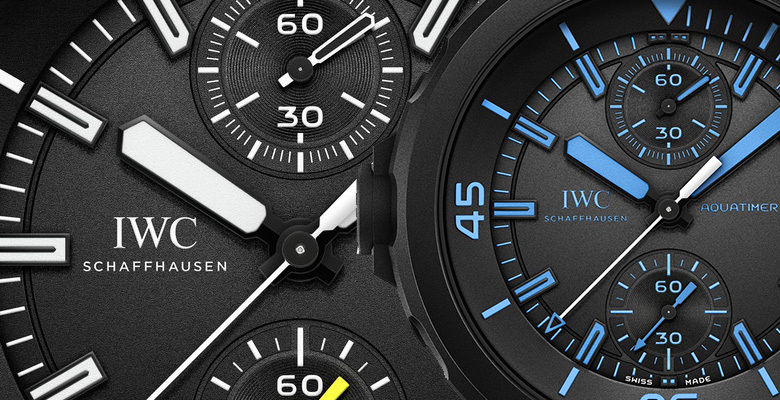 On the occasion of the Charles Darwin Foundation celebrating the fiftieth anniversary of its Research Station on the Galapagos Islands World Heritage Site, Schaffhausens’ finest, IWC have marked the Foundations’ historic milestone with two new editions of its Aquatimer Chronograph. Since establishing a close relationship with the Charles Darwin Foundation in 2009, with IWC committing a significant ongoing donation to the organisation whose raison d’être is in scientific research and the fight to preserve much of the unique flora and fauna found only across the equator-straddling archipelago, working in accord with the Ecuadorian Government and the Galapagos National Park Directorate. 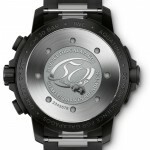 Since 2009 IWC have released a new special Aquatimer Chronograph Edition “Galapagos Islands” each year to mark the association, and the fact that 2014 is a jubilee year for the Foundation has afforded the opportunity to not only release their annual special edition, but also the chance to create a very cool ‘bonus’ 500-piece commemorative jubilee Aquatimer Chronograph Edition “50 Years Science for Galapagos” too, and in doing so IWC have nailed it once again. 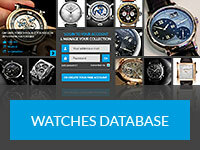 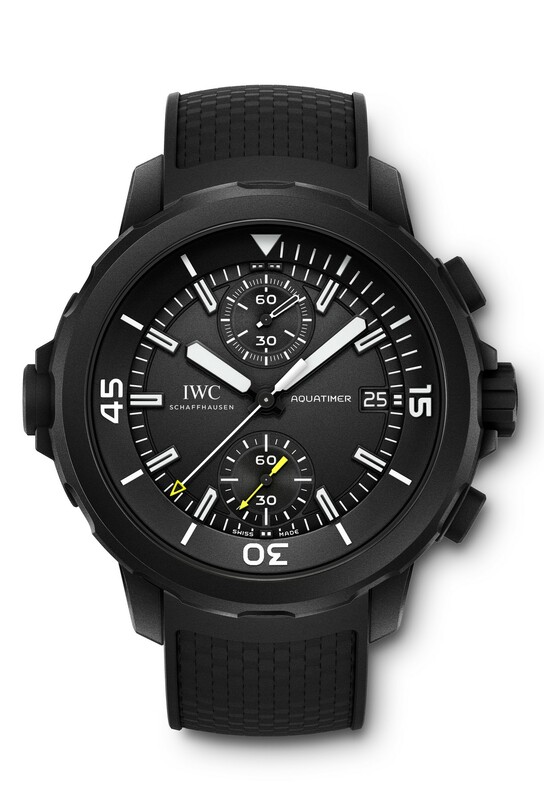 2014 saw a ground-up redesign of IWC’s increasingly popular Aquatimer sports watch collection, and the principal novelty is the proprietary SafeDive system which reqires a sophistcated sliding clutch mechanism, located at the 9 o’clock position, through which the wearer is able to freely manipulate the outer bezel in either direction, whilst a clever ratchet device prevents the sub-sapphire unidirectional dive scale being accidentally advanced by disengaging the internal bezel from the clockwise motion of its external counterpart, preventing the risk of the wearer getting a potentially dangerous misleading reference when relying on it to time his dive. 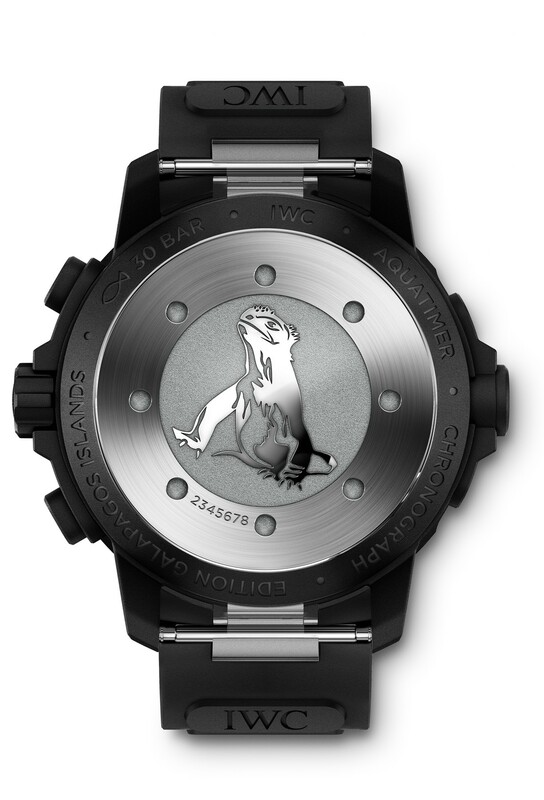 Manufactured to IWC’s bullet-proof build quality in a 44mm stainless steel case, the Galapagos models are entireley cloaked, right down to the crown and pushers, with a matt black vulcanised rubber coating, relfecting the black igneous rock synonymous with the Galapagos and which, when combined with the black dial and natural rubber strap gives the watch a purposeful, Tonka-tough appearance as well as a highly tactile surface which is very practical in wet or slippery conditions. 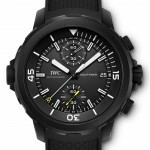 The two editions are broadly similar but where they do differ, the effect is quite striking. 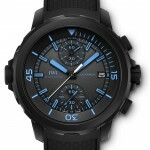 The ‘regular’ annual edition features white hands, indices and detailing, whereas beneath the sapphire crystal on the“50 Years Science for Galapagos” version the hands, markers and other detail are coloured in a vivid blue, which really makes the watch stand out, and it’s not by chance or fancy that this colour has been used, as it matches almost to perfection the same hue of the eponymous blue footed booby, which is indigenous to the Galapagos archepelago. Turned over and both editions feature commemorative inscribed solid casebacks which have not been treated with the rubber coat, a 50-year tribute based around a sea turtle design or an iguana on the annual edition, and as is now traditional with the annual Galapagos editions, both models are presented on a natural rubber strap with robust tang buckle. 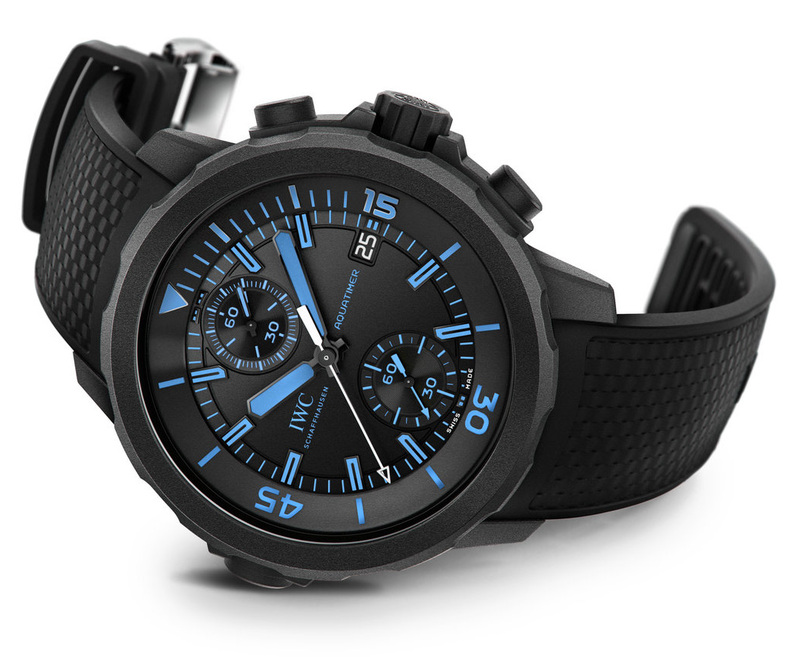 Inside, the two hand chronograph arrangement is powered by the IWC Caliber 89365 automatic self-winding movement with flyback solution for the chronograph reset. 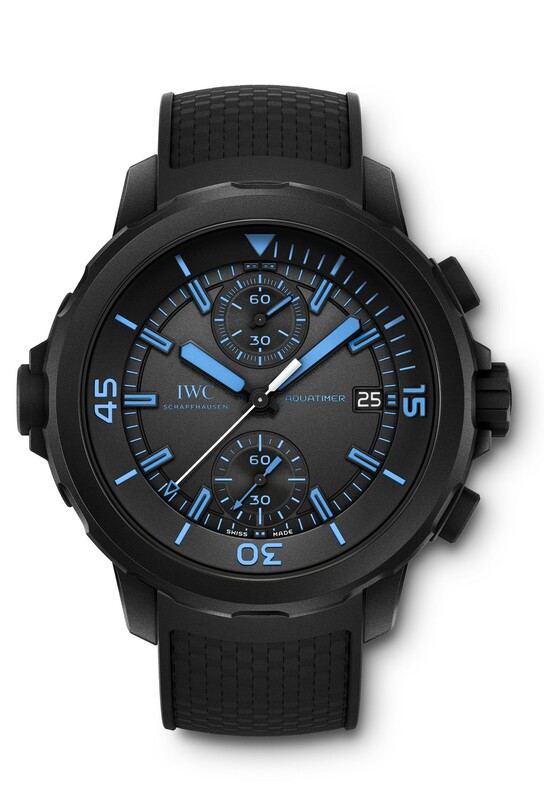 You can read the Hands-On review by Angus Davies of the IWC Galapagos Editions 2014 on DreamChrono.